Two years ago, Ezekiel Elliott made history by jumping into a Salvation Army Red Kettle bucket to celebrate a touchdown on Thanksgiving. This year, it was Dallas Cowboys quarterback Dak Prescott‘s turn. 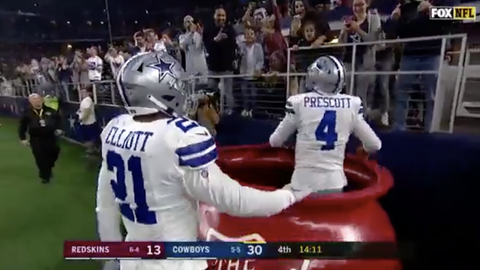 After an incredible run by #4 gave Dallas a 30-13 lead over the Washington Redskins early in the 4th quarter, Elliott picked up Prescott and “donated” him into a bucket behind the endzone in front of a sellout crowd at AT&T Stadium. Watch the touchdown and celebration below.